Vicky has had the privilege of being a World Health Hero for the last 12 months, she is also City Coordinator for Cheltenham and Swindon. To find out more about what we do, why not watch the two short videos on this page for a snap shot or go and have a look at our YouTube Channel. ​While Vicky essentially works with business people, very often the root cause of her client’s problems are something very personal. Likewise, Vicky’s journey to the business woman she is today was very personal too, struggling with Fibromyalgia from January 2010 and a life time of Ehlers-Danlos Syndrome, formally diagnosed in June 2015, Vicky was in a bad place, mentally and physically and this had a huge impact on her work and personal life. Through major lifestyle changes she regained control of her body, lost 5 stone and brought the symptoms of her illnesses under control giving her a new lease of life. The real magic started though when she did a 3 day Success Breakthrough course with Daniel Tolson, a new found ability to control her mind and her emotions lead to becoming a Coach and now a Master Coach. Vicky now knows how to ‘do’ fibromyalgia and how to ‘not do’ fibromyalgia and lives a pain free life. As a World Health Hero, Vicky now coaches others with chronic pain and fatigue to improve their lives too. 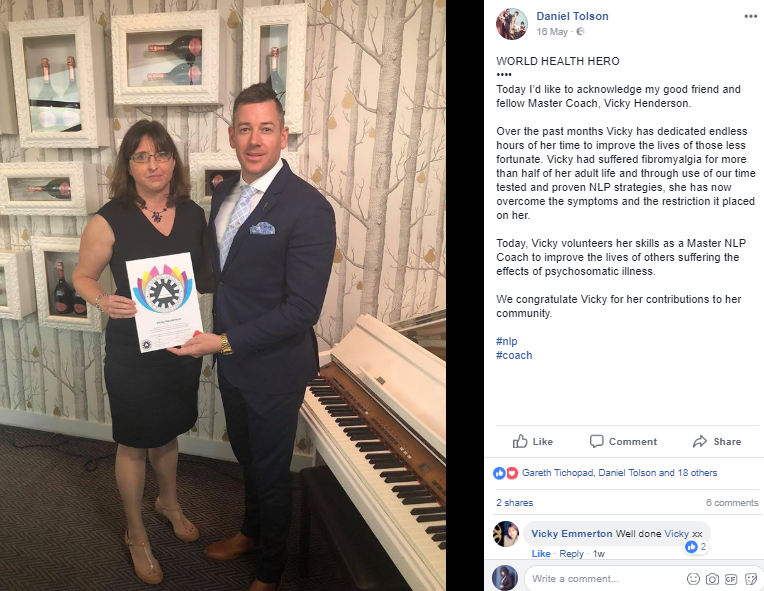 In March 2018 Vicky was recognised by Daniel Tolson for her work with a client through The Tolson Institute Success Charity and in April 2018 he also recognised her for her work with World Health Heroes.